2 Refurbished @ $115, see the TAB below. HDTV Supplys WolfPack 4K HDMI HDBaseT Extender is based upon the HDBaseT protocol & can transmit an uncompressed HDMI video, audio & IR signal via a single CAT5e/6 cable to a distance of 70 meters or 220 feet away from the source depending upon the resolution. The video & audio are not compressed, there is no latency & the audio & video will always be in synch. The HDMI signal source can be controlled by your existing remote control over one single home run CAT5e/6/7 cable and has 20~60kHz Wide band Bi-directional IR to support any remote control that you own. Our HDMI HDBaseT Extender also supports 4K video (30 Hz) to the below UTP cable lengths. The supplied AC adapter needs to be put on the Receiver, not the Transmitter, if you are using the IR function. NOTE: This product is being discontinued and replaced with 4K WolfPack HDMI HDBaseT Extender. Also, see the above SIMILAR Tab for equivalent products or call us at 833-WOLFPACK (833-965-3722) right now to discuss your needs. 20~60kHz Wideband Bi-Directional IR: Over the same CAT5e/6/7 cable you can send commands from a control system to the TV as well as simultaneously control DVD players, cable boxes and other source equipment from the TV location. The IR works in only stand alone applications with one source and one TV. The supplied AC adapter needs to be put on the Receiver, not the Transmitter, if you are using the IR function. With Built-in IR extender function. The supplied AC adapter needs to be put on the Receiver, not the Transmitter, if you are using the IR function. IR remote control allowing any remote control due to it supports a wide 20~60kHz frequency and has Bi-directional IR transmission. The supplied AC adapter needs to be put on the Receiver, not the Transmitter, if you are using the IR function. HDTV Supplys implementation of the HDBaseT technology adds virtually zero latency to the HDMI audio & video signal, less than 7 microseconds (0.000007 sec) over 220 feet of CATx cable. At 100 feet you are talking about 3 microseconds (0.000003 sec). This means for example, in a church or auditorium, the speakers lips are always in synch with the video image on all the TVs & projectors 100's of feet away. HDTV Supplys WolfPack HDMI HDBaseT Extender supports HDMI 1.4 and HDBaseT 3Play technology to allow transmission of uncompressed, 1080p high definition television signals over a single CAT5e/6 home run cable. These HDMI 1.4 signals include 3D and 4Kx2K UHD formats and allow DVI signal transmission with appropriate DVI to HDMI cable adapters. In addition, embedded LPCM 7.1CH, Dolby TrueHD, Dolby Digital Plus and DTS-HD Master Audio capability is standard. Our HDMI HDBaseT Extender is based on HDbaseT technology, it can extend your high resolution up to 70 meters away your HDMI source by using single Cat5e/6/7 cable. Fully HDCP compliant transmission means source video content can be stored in a dedicated pack away from the viewing location; and control is provided via built-in support for HDMI-CEC transmission and Infra-red relay. Support 20~60kHz wide frequency devices and Bi-directional IR transmission. The supplied AC adapter needs to be put on the Receiver, not the Transmitter, if you are using the IR function. The HDBaseT technology allows both HDMI audio and video signals to travel over a single CAT5e, CAT6 or CAT7 UTP cable from the transmitter to the receiver. The UTP also transports the IR control commands from the display to the source. Our HDMI HDBaseT Extender offers solutions for digitalentertainment center, HDTV retail and show site, HDTV, STB, DVD and Projectorfactory, noise, space and security concerns, data center control, information distribution, conference room presentation, school and corporate training environments. 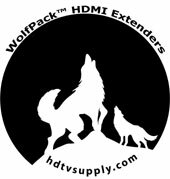 HDTV Supply has a few refurbished 4K WolfPack HDMI HDBaseT Extenders to 220 Feet with IR. They are tested and work perfectly. The HDMI HDBaseT Extenders are sold with a one year warranty for a very low price of $115 plus shipping, First Come-First Serve, so place your order today as they won't last long. Call Sales at 833-WOLFPACK (833-965-3722) and tell them about where you saw this. HDTV Supply has this HDMI HDBaseT Extender in stock in our California warehouse so place your order at the above ADD TO CART button by 11AM PST and it can ship today or call us at 833-WOLFPACK (833-965-3722) to place your order. Q: I have no image output? A: Check the LED indicator status to make sure all connections are good and stable. Q: Signal LED "3" is flashing but there is no image output? A: Check if the HDMI display device has been switched to the right HDMI input channel. Q: Signal LED "2" is flashing but "3" light is off? A: Check whether the Transmitter HDMI IN has a signal input and make sure the Receivers HDMI OUT is well connected with HDMI display. A: Change the Transmitter HDMI signal input cable or use shorter HDMI cable. A: These HDMI extenders will send both HDMI video and audio from a matrix or splitter, etc but the remote IR is designed to be used with only one source, like a cable box, to one widescreen. There would be too many IR cables to attach on the sources IR window. See our HDMI switchers and splitters that have it integrated. The supplied AC adapter needs to be put on the Receiver, not the Transmitter, if you are using the IR function. A: This HDMI HDBaseT Extender features CEC (Consumer Electronics Control) allowing your HDTV's remote to manage up to ten devices that are connected via HDMI (such as Blu-ray Disc players or home theater receivers) with no special programming needed. For example, you can use your remote to turn on your TV, your player, and your receiver at the same time, and adjust the system volume with one button. All devices must support CEC, though. HDTV Supply includes a 1 Year Limited Warranty on this HDMI HDBaseT Extender. The warranty states that (a) this unit will perform substantially in accordance with the accompanying written materials for a period of 1 year from the date of receipt and (b) that the HDMI HDBaseT Extender will be free from defects in materials & workmanship under normal use & service for a period of 1 year. In order to get a warranty replacement for a defective product, HDTV Supplys Support Team will verify the product is eligible for warranty. An RMA number will then be issued. The shipped unit will be in like new conditions, tested and all components included. HDTV Supply also sells a 3 and 5 Year Extended Warranty for this HDMI HDBaseT Extender. Please go to Extended Warranties or see the above Options to purchase it. The Wolfpack™amily can roam long distances even some up to 300 feet over HDBaseT trails and howl 4K whereas those who try to trap the WolfPack fails & runs away to the older devices.